An MCS Index chart for the rest of us. A while back I was doing some research into my iPhone 6+’s 802.11ac capabilities and I needed to look some things up on an MCS Index chart. I found a several different chart but found them to be a bit hard to read. Either that or the charts were massive and covered more information than I really needed. You can find one such example at mcsindex.com. I decided I needed to create my own MCS Index reference chart I could carry with me. With the help of the always wonderful Excel I was able to put together this one. I think you’ll find, like me, this chart is useful while not too overbearing. Take a look at the chart and see what you think. You can click on the image to open up a full resolution version to interact with – and maybe even bookmark for future reference. This was the first version of the chart I created. Go ahead and click on this image as well – it will bring you to the same page where you can see a larger version, interact with, and bookmark for future reference. Or, do what I did – which is why I created these charts – Fill out the form above and we’ll send you a high quality PDF version of the chart you can print off, laminate and carry with you as a quick reference page. Or, check out the notebook. I recently created for a recent #WLPC event a custom “field notebook” – that are still available on the store HERE. These notebooks were created for you to carry with you on the job that contain several laminated reference charts, dry erase pages and some blank grid paper. The idea being you can easily and quickly pull out the notebook when interacting with a customer, supervisor, or just to help you. It’s portable, actually fits in your back pocket, but high quality enough and professional looking to be able use with a client. What is the MCS Index? 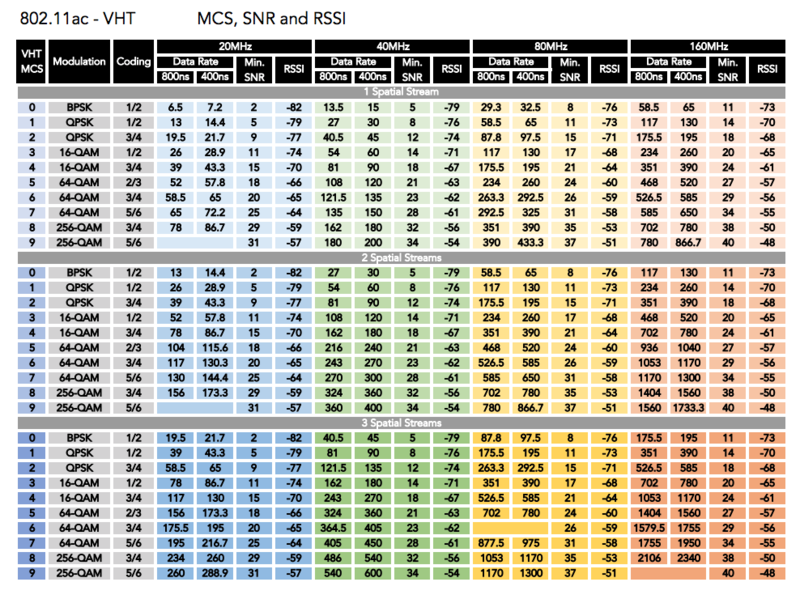 This MCS index chart is a quick way to easily find what modulation rates might be in use. When using a Mac OS system, you can find this information by holding down the Option-Key and clicking on the Wi-Fi symbol. For Windows machines you have to reverse-engineer from the ‘Data Rate’ you see. In this chart I’ve used some additional data from Andrew von Nagy’s website and Capacity Planner. These gave me some generic recommendations for Minimum SNR and RSSI at each of the MCS levels. Check it out at this link – http://www.revolutionwifi.net/capacity-planner/. Note, these are not ‘absolute’ numbers – but an amalgamation of data from a variety of sources. These are not ‘absolute’ numbers – but an amalgamation of data from a variety of sources. 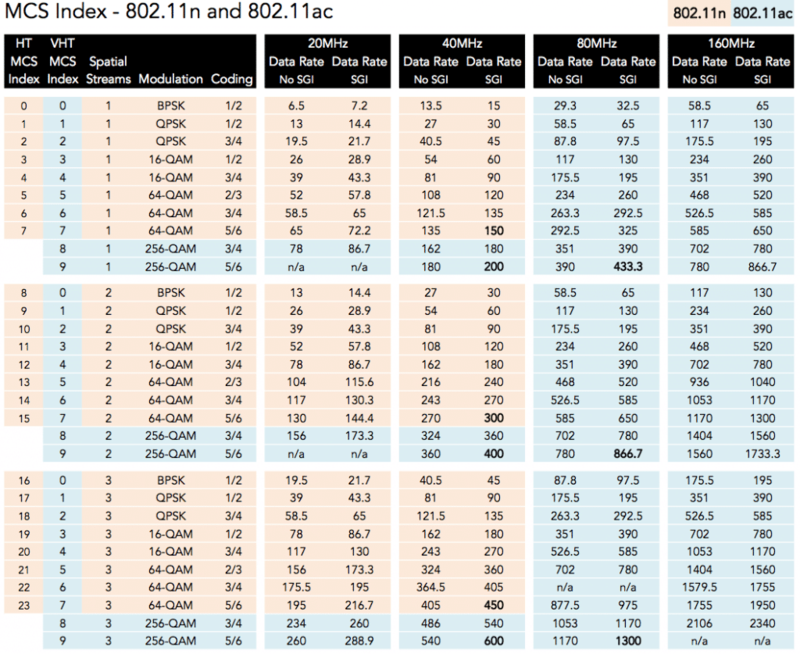 The older version of the MCS index chart showed the differences between 802.11n MCS’s. They counted up from 0 to 77. The updated way of counting MCS’s moving forward with 802.11ac – and that is to count MCS 0-9 for each set of spatial streams. This chart is one I laminate and have with me all the time. When any device, either AP or client wants to transmit, it will choose ONE of these cells and attempt with that unique set of technical features. If it is successful and the Transmitter receives an ACK – then it will most likely continue to use that set of features as categorized by an MCS index. If it repeatedly fails, then each individual firmware logic will make a different choice of paths through this chart in order to find a feature set that is effective. Some firmware algorithms drop back to MCS 0/1×1:1 and then move up slowly. Some try changing columns, others still move up in the same column. The goal is to find a combination of technical features that result in the fastest and yet most stable set for the environment at that moment. By the way – these are from the Transmitter’s point of view… Receivers do NOT have any control over this decision process. Receivers either can decode the frame and send an ACK, or they can’t and they don’t respond. It is up to the Transmitter to find the best possible combination. Also – it is fairly rare, and not required at all, to have AP to Client and Client to AP transmitter/receiver combinations use exactly the same MCS options at the same time. These are some of the charts I created for my own reference and am happy to share with you. But are there some reference charts you have created? What about other reference pages that you like to utilize? What do you find most helpful? Tell us about them in the comments or jump on twitter and be sure to interact with the very active Wireless LAN Professionals community online. In fact, if you have some more specific questions that’s a great place to get quick and varied responses. Need a refresher on understanding different 802.11 Modulation Types?